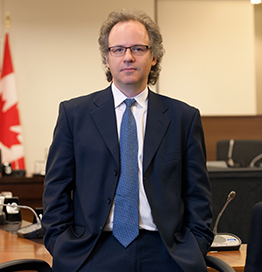 Dr. Michael Geist is a law professor at the University of Ottawa where he holds the Canada Research Chair in Internet and E-commerce Law. He has obtained a Bachelor of Laws (LL.B.) degree from Osgoode Hall Law School in Toronto, Master of Laws (LL.M.) degrees from Cambridge University in the UK and Columbia Law School in New York, and a Doctorate in Law (J.S.D.) from Columbia Law School. Dr. Geist is the editor of many books including Law, Privacy and Surveillance in Canada in the Post-Snowden Era (2015, University of Ottawa Press), The Copyright Pentalogy: How the Supreme Court of Canada Shook the Foundations of Canadian Copyright Law (2013, University of Ottawa Press), From “Radical Extremism” to “Balanced Copyright”: Canadian Copyright and the Digital Agenda (2010, Irwin Law) and In the Public Interest: The Future of Canadian Copyright Law (2005, Irwin Law).He is also the editor of several monthly technology law publications, and the author of a popular blog on Internet and intellectual property law issues. Dr. Geist serves on many boards, including the CANARIE Board of Directors, the Canadian Legal Information Institute Board of Directors, the Canadian Internet Registration Authority Board of Directors, and the Electronic Frontier Foundation Advisory Board. He has received numerous awards for his work including the Kroeger Award for Policy Leadership and the Public Knowledge IP3 Award in 2010, the Les Fowlie Award for Intellectual Freedom from the Ontario Library Association in 2009, the Electronic Frontier Foundation’s Pioneer Award in 2008, Canarie’s IWAY Public Leadership Award for his contribution to the development of the Internet in Canada and he was named one of Canada’s Top 40 Under 40 in 2003. In 2010, Managing Intellectual Property named him on the 50 most influential people on intellectual property in the world and Canadian Lawyer named him one of the 25 most influential lawyers in Canada in 2011, 2012 and 2013. More information can be obtained at http://www.michaelgeist.ca.